we are finishing this week with introducing you one of the most profitable GEO’s Zetaniche is working with – Lithuania. If you didn’t have a chance to visit this beautiful country, in case you do, don’t be shocked if you find yourself falling in love with it’s rich and inviting nature, beautiful national parks, serene lakes, deep forests, and some cozy little towns, but as well as friendly Lithuanian people – this country has pretty much everything that a traveler might be looking for! One of the most famous Lithuanian dishes is Cepelinai. It was named so because of its oval shape which resembles a Zeppelin airship. Some philologists generally agree that Lithuanian is the most ancient of all the living languages. Moreover, the country is home to one of the largest moving sand dunes in Europe. Lithuania has one of the fastest Internet connections in the World, which will surely be very interesting for you. Estimated population number in 2017 was 2,850,030. The official language is Lithuanian. Lithuanian is one of the oldest language in the world today. This language is one of the oldest living Indo-European language of Europe. 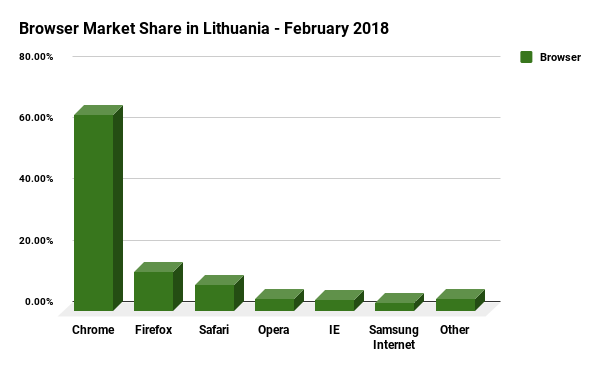 According to latest stats there are 2,199,938 internet users in Lithuania, which makes (77.2%) share of total Lithuania population and (0.1%) share of world internet users. 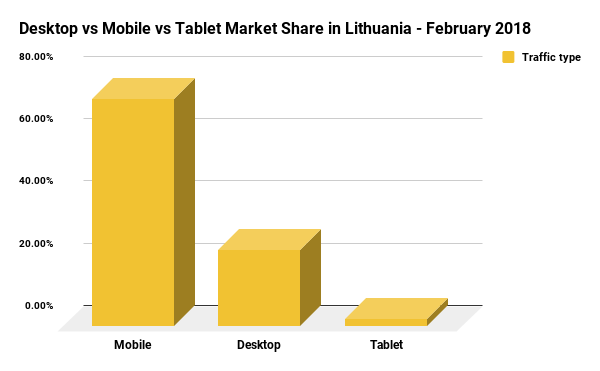 Desktop vs Mobile vs Tablet Market Share in Lithuania in February 2018 was: Desktop (73.04%), Mobile (24.58%) and Tablet (2.38%). 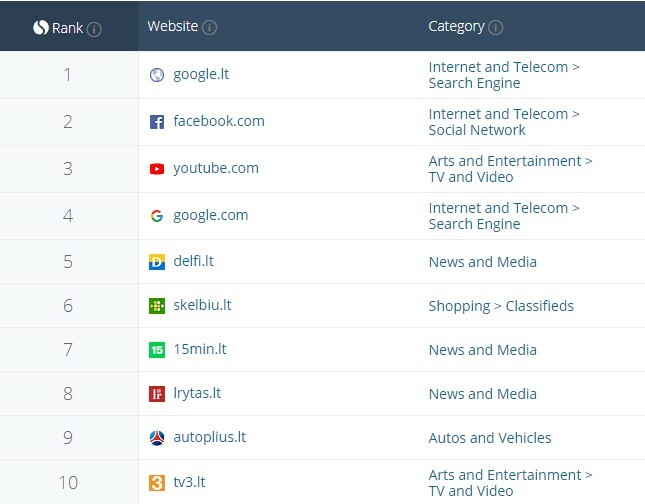 (4.01%), IE (3.72%), Samsung Internet (2.86%), Other (3.94%). 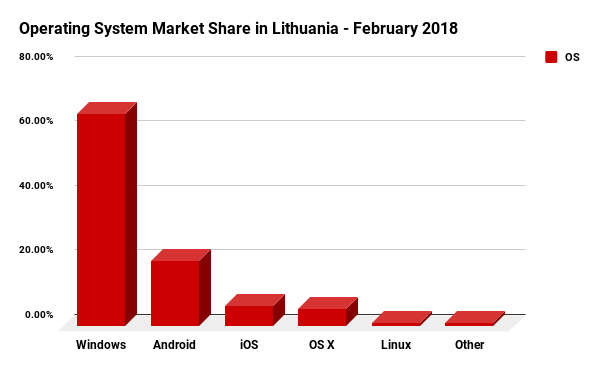 Operating System Market Share in Lithuania in February 2018 was: Windows (65.79%), Android (20.34%), iOS (6.39%), OS X (5.43%), Linux (1.12%), Other (0.93%). 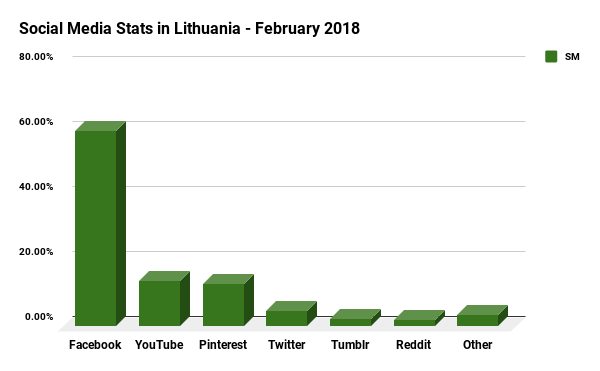 Social Media Stats in Lithuania in February 2018 were: Facebook (60.01%), YouTube (14.13%), Pinterest (13.21%), Twitter (4.71%), Tumblr (2.33%), Reddit (2.08%), Other (3.53%). There are currently 1.32 million online buyers in Lithuania, with an additional 420,000 users to be shopping online by 2021. These 1.74 million online buyers users will represent 72.9% of the total population. When it comes to gender share, males outnumber female online shoppers. Males between the ages of 25-34 account for the biggest market share, representing 230,000 shoppers. The second biggest category of online shoppers is women aged between 25-34, accounting for just over 190,000 online shoppers. 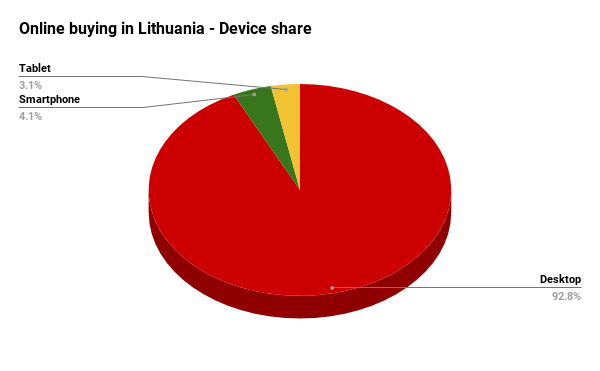 The biggest amount (93%) of online shoppers in Lithuania shop online via Desktop. (4%) of shoppers make purchases via Smartphone and (3%) made their most recent purchase via Tablet. 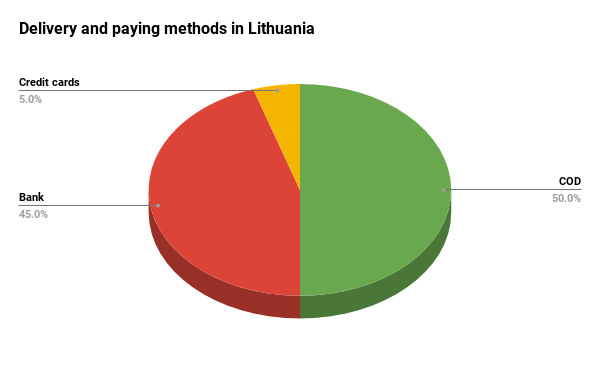 COD is the most preferred type of payment in Lithuania (by 50% of consumers), following bank links are preferred by (45%) and credit cards by (5%). Why to start promoting Zetaniche offers in Lithuania? various offers in most popular niches. Guys, we are sure that we showed you how big potential this GEO has in regards of promoting offers. JOIN OUR NETWORK today and get started with our most wanted offers in Lithuania. Our devoted Team is here to help you with anything you may need. Feel free to Skype us at aff_zetaniche or email us at support@zetaniche.com anytime!